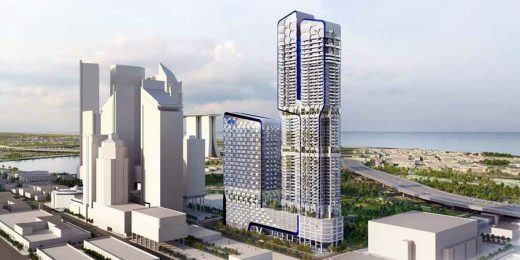 Developer: UIC Investments (Properties) Pte Ltd. The first, and most recently completed project is V on Shenton. 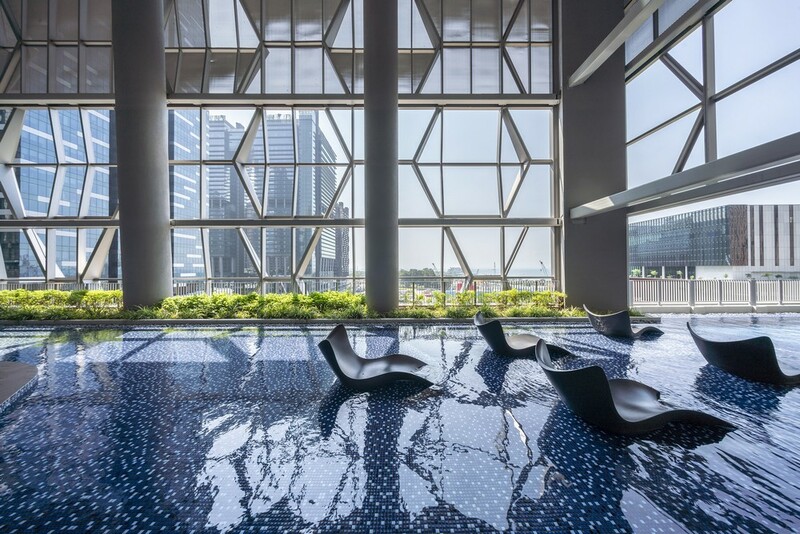 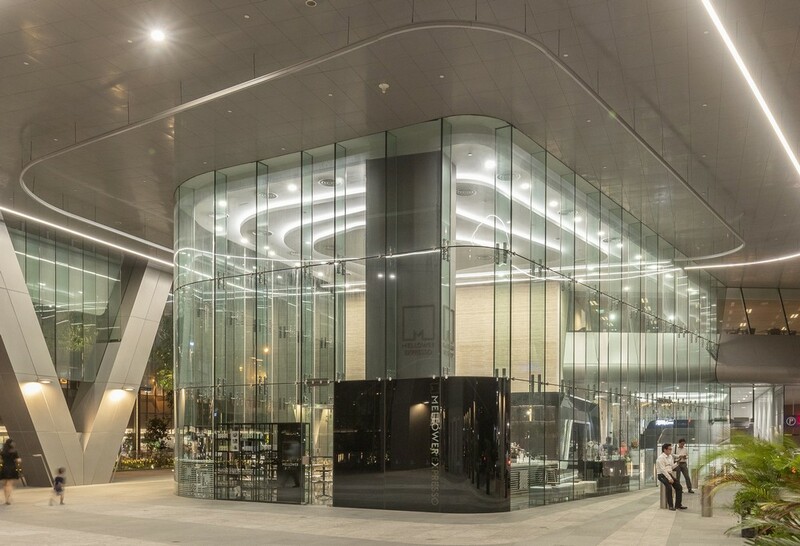 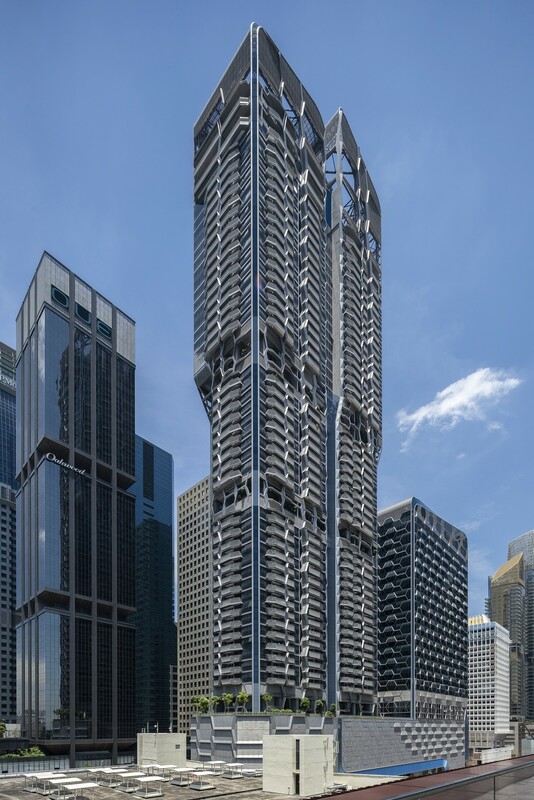 V on Shenton is located at 5 Shenton Way in the heart of Singapore’s Central Business District and occupies the space of the former UIC Building. Vertical expansion has for some time proved to be a solution for the efficient use of valuable urban land. 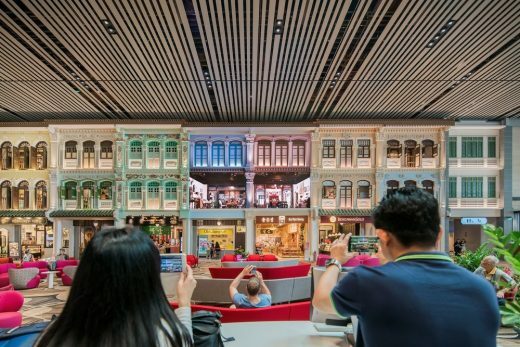 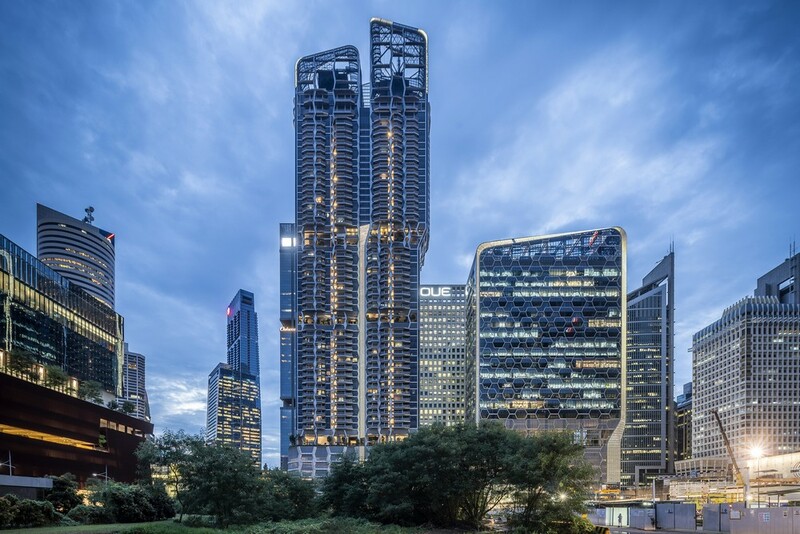 However, it has recently become clear that such expansion can be further maximised through the introduction of large scale, holistic, mixed-use developments that offer round-the-clock programmes. 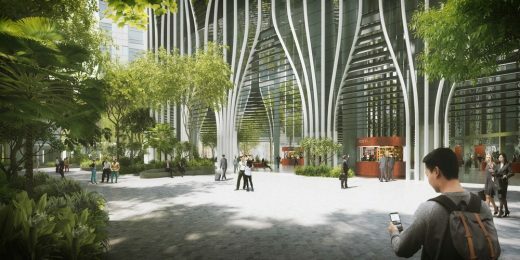 In these developments working, living and leisure activities are catered for within single plots, ensuring maximal use of scarce land. 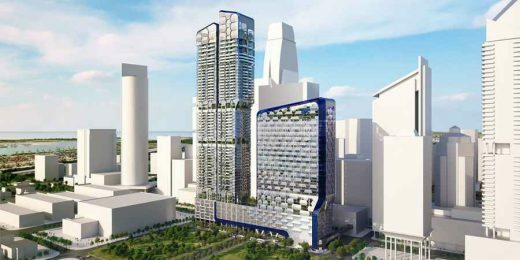 V on Shenton is just such a development. 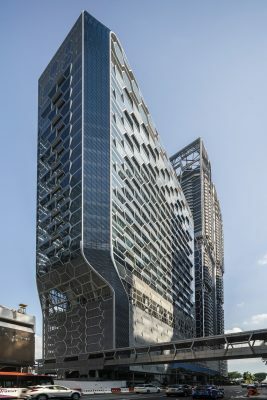 The dual programming of the building (office and residential) is a unique situation in this area and thus the massing of the towers is differentiated to reflect this. 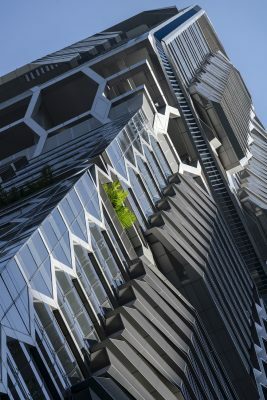 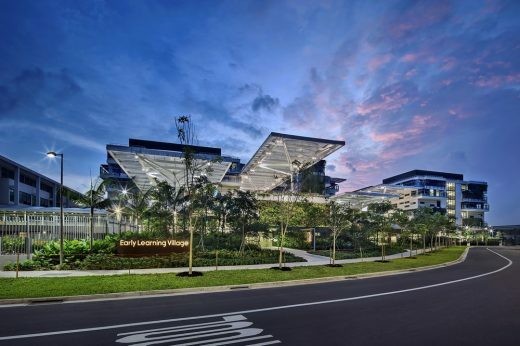 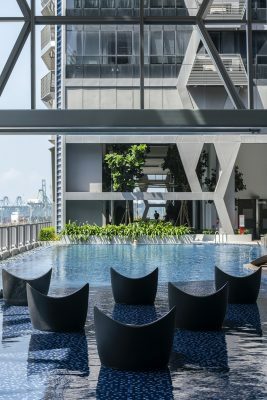 In addition to the office and residential programmes, the towers house sky gardens which provide panoramic 360 degree views of Singapore and house a variety of amenities, such as a fitness area, swimming pools and a children’s play area, with lush green vegetation providing fresher, cleaner air. 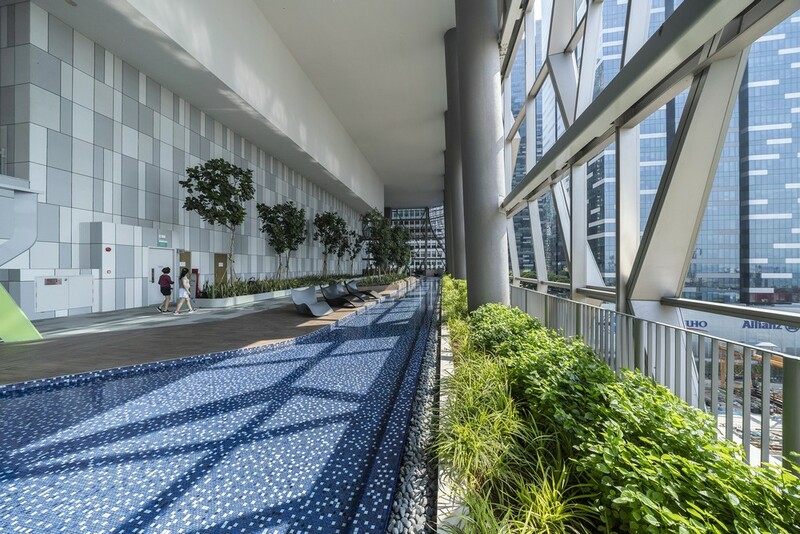 These areas provide spaces for shared communal activities, or for the residents to entertain guests. 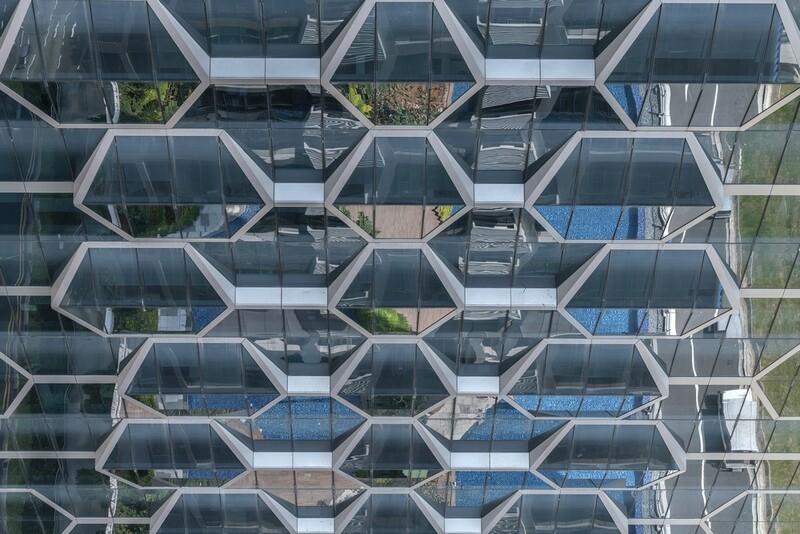 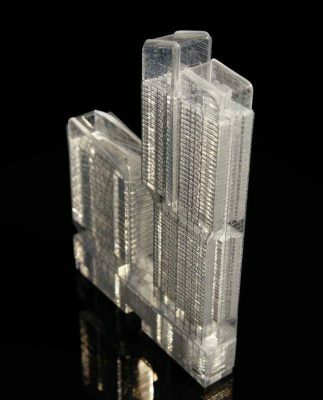 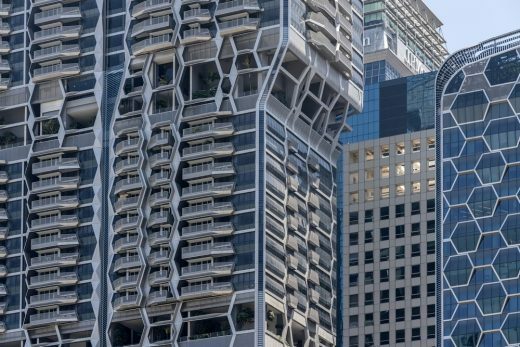 The office tower is based on a curtain wall module and an optimised number of panel types, recombined to create a signature pattern. In contrast, the residential facade is based on the stacks of unit types. 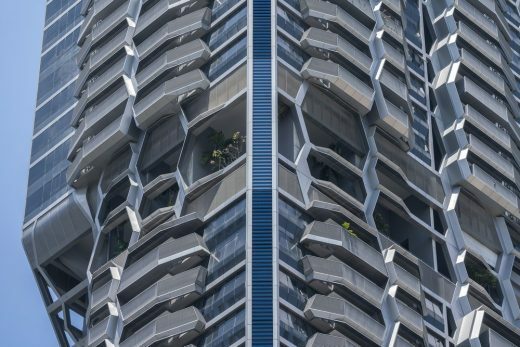 The pattern of the residential facade is created by the incorporation of the residential programme (balcony, bay window, planter and a/c ledge) and the combination of one and two storey high modules with systematic material variations. 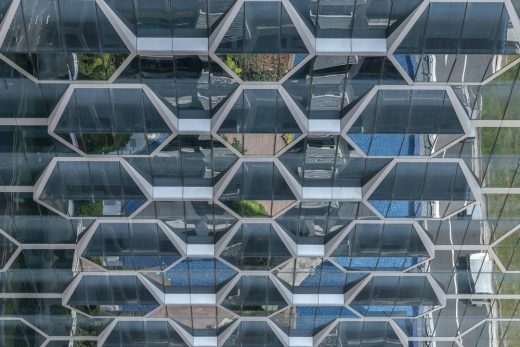 These geometric panels add texture and cohesion to the building, whilst reflecting light and pocketing shade. 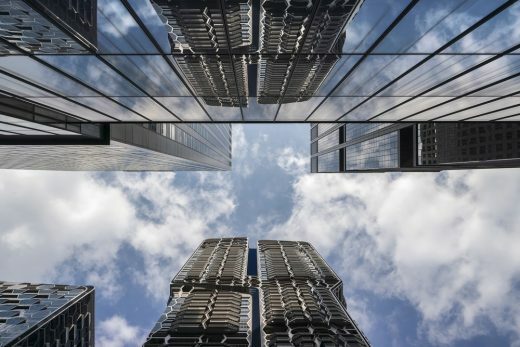 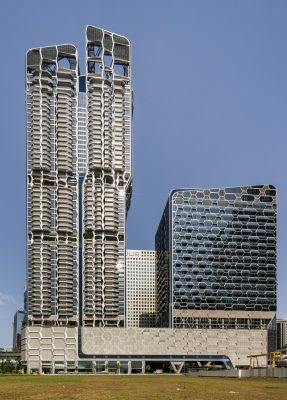 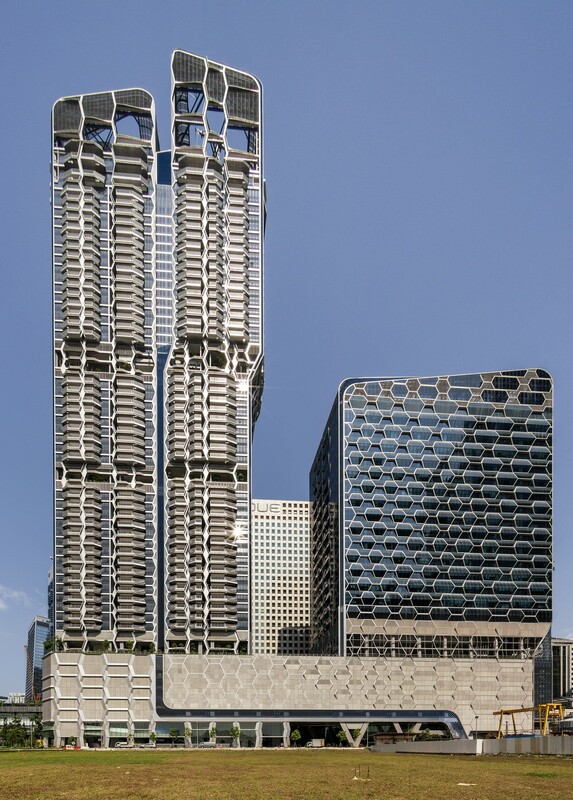 Located in the heart of Singapore’s Central Business District, the former UIC Building dominated the city skyline as Singapore’s tallest building for many years following its completion in 1973 and formed part of an important collection of towers located along Shenton Way. Recently the area has undergone a rejuvenation and transformation and V on Shenton – the new UIC building – forms part of this redevelopment. 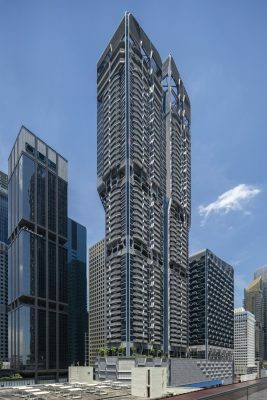 The mixed-use programming of V on Shenton presents a unique situation in this area of the city. In addition to the office and residential programmes, the dual tower building houses a number of fully integrated sky gardens which provide panoramic 360 degree views of Singapore and house a variety of amenities – such as a fitness area, swimming pools and a children’s play area, with lush green vegetation providing fresher, cleaner air. 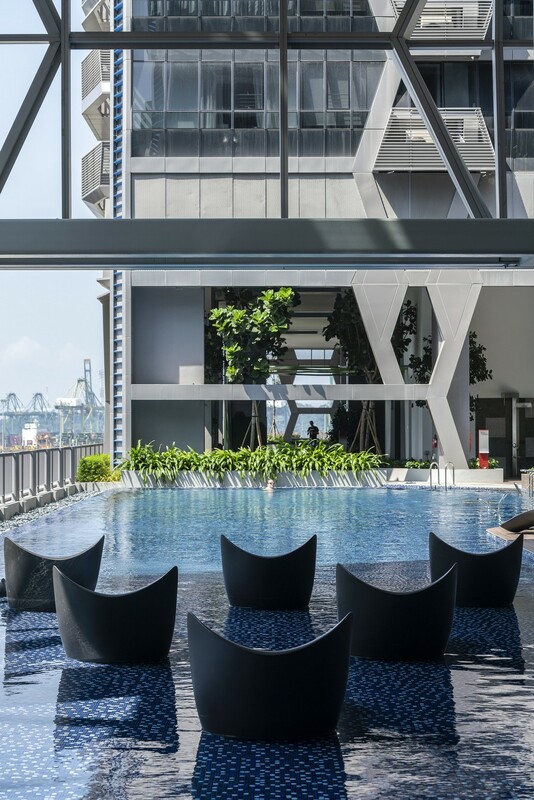 These areas provide spaces for shared communal activities, or for the residents to entertain guests. 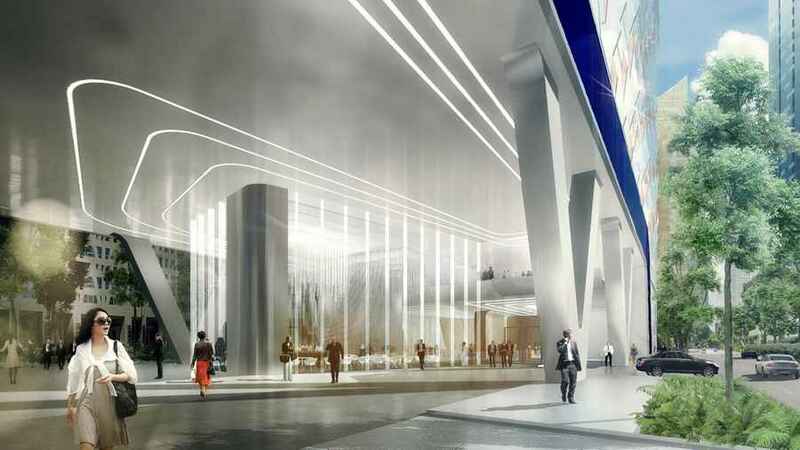 On the ground floor of the development stainless steel lines are inlaid into the floor, lines of light in the ceilings emphasise common areas, vertical lamellas clad the car ramps and together these form the guiding principles for pedestrians to their destination.